Great early coverage of Texas football moving on from Colt McCoy to new quarterback Garrett Gilbert from ESPN. Read Ivan Maisel’s excellent article on Gilbert with quotes from Texas coach Mack Brown, McCoy, and current teammates, and then be sure watch the video of on the story. 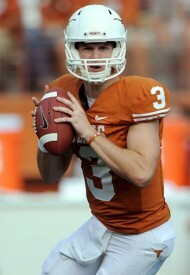 Don’t tell Jordan Shipley, but Texas QB Colt McCoy has a new roomie. As he prepares for the upcoming NFL Draft, Colt is rooming with Stanford running back (and Doak Walker Award winner) Toby Gerhart for workouts out in California. Funny Photoshops on EDSBS ensue. Texas QB Colt McCoy: He leaves school as the most statistically proficient quarterback in school history, although his career will forever be marked by his near misses in the Heisman Trophy balloting over the past two seasons and his injury in his final college game against Alabama. Garrett Gilbert will be facing some big shoes to replace when Texas practice starts later this month. Read the full top 5 biggest shoes to fill. No embed available, but the Dallas Morning News has posted the video of Plano West defensive end Jackson Jeffcoat making his commit to the Texas Longhorns. On the video Jackson makes his announcement, answers a couple of questions, and then they talk to his coach and his dad. He didn’t get voted in like he should have, but Kevin Durant has been named as a reserve for the NBA All-Star game. The first of many I’m sure. Former Texas wide receiver/flex tight end Dan Buckner has found a new home. After the Texas coaching staff and Buckner decided to part ways due to his arrest last week, word came out yesterday that Dan will be transferring to Arizona. He is already enrolled and will participate in spring drills, but due to NCAA transfer rules he will sit out the 2010 season. ESPN is reporting the USC Trojans’ head coach Pete Carroll and the NFL’s Seattle Seahawks have reached an agreement in principle to make Carroll their next head coach. He may also become team president and have control over personnel decisions. This could be big for the Longhorns as top defensive end recruit Jackson Jeffcoat, who is believed to be deciding between Texas, Oklahoma, and USC. The official UT site has up some more photos from the Longhorns trip in Pasadena for the national championship game. They’ve got shots of the players at practice, dealing with the media, and out on the town. The 2009 Heisman was only awarded a week ago and we’re already moving on to 2010. College Football News has released a very early list of next year’s top contenders for college football’s biggest award and it’s mostly pretty solid. Sitting at number 15 is a quarterback who had less than 30 attempts and had no touchdowns passes this year. Remember, Vince Young couldn’t be replaced, either. Gilbert might be the most talented quarterback Mack Brown has ever coached. Overall not a bad list, but think there are some weird names near the very top. [tag]Ohio State[/tag] quarterback Terrelle Pryor has shown zero flash of Heisman-caliber performance and appears to be getting worse (or being used worse by OSU coaches) each year. I also wonder if [tag]Alabama[/tag] defending winner Mark Ingram will be able to repeat with stud Trent Richardson taking more carries away next season.